This Google map shows the burial or memorial places for the Deseronto men who died during the First World War. This memorial project has revealed a lot to us about the Deseronto people who were directly involved in the First World War. For many of those who lived through this conflict, their lives would be forever altered by the loss of loved ones, friends, and health. Our thanks to all those who have contributed additional information and family stories about these people, who would otherwise just be names in records. It has been an honour to learn about them all and to reflect on their experiences. Lieutenant Harold Macdonald Pineo died of influenza on this day in 1918 in the Royal Air Force hospital in Deseronto. He had transferred to the Royal Air Force in May 1918 from the army, and had only been with 42nd Wing since September 19th, 1918. Pineo was buried in Virden Cemetery, Manitoba. On this day in 1918 Sergeant John Ray Holland died at Camp Rathbun Hospital in Deseronto of pneumonia caused by influenza. Holland was a carpenter who had joined the Royal Flying Corps in England on July 6th, 1916. In March 1917 he was transferred to the new training camps in Canada where he was promoted corporal in August 1917 and sergeant in April 1918 when the Royal Flying Corps became the Royal Air Force. In some records his name is given as Roy, rather than Ray. He had previously served for four years in the 3rd West Riding Brigade of the Royal Field Artillery. Holland was born in Bakewell, Derbyshire in 1890. In the 1911 census he was listed as an apprentice joiner, living in Sheffield, West Yorkshire. He married Phyllis Rhodes in Sheffield on September 23rd, 1914 and the couple had two children, born in February 1915 and April 1916. Holland’s parents were Richard and Annie Holland. They were living at 56 Cherry Street in Sheffield when he died. John Ray Holland was buried in Deseronto Cemetery. On this day in 2018, Con Barnhart died in No. 12 Canadian General Hospital in Bramshott, England of meningitis. Con was buried in St. Mary’s Churchyard, Bramshott. 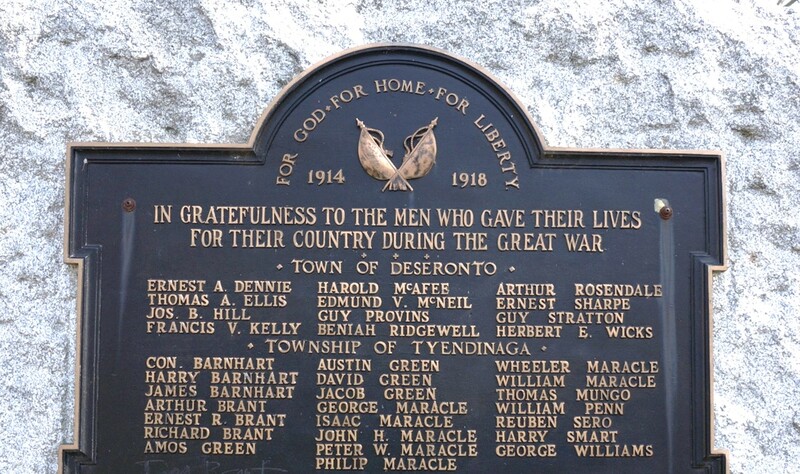 He is also remembered on the Deseronto war memorial. On this day in 1918 David John Powless died of pneumonia at 913 Dundas Street, Toronto. He had been discharged four weeks earlier from the army due to being over age (he was a few weeks shy of his fiftieth birthday). He had served overseas for 22 months. Initially the Dominion Pension Board refused to pay his widow, Rose, a pension, as Powless had already been discharged when he died. The Toronto Star took up her case, claiming that the widow and her children were surviving on $8 a week, the earnings of her daughter. This photograph from the newspaper shows Rose with Douglas, Florence, Edwin, Mayford and Alfred. The attending physician gave his certificate that Pte. Powless would undoubtedly have recovered had it not been for the fact that service overseas had undermined his constitution. But owing to the fact that death occurred after discharge, and there was no disability on record, no pension was granted to the widow on her application. The board at Ottawa wrote that the regulations did not permit it. Just before Christmas the G.W.V.A. [Great War Veterans’ Association] found Mrs. Powless in a destitute condition, the earnings of her 15-year-old daughter being her sole income. They gave what relief they could, and other societies joined with them. After an application had again been refused at Ottawa, the case was taken up by Central Branch G.W.V.A., and was reinvestigated by the Ontario office of the board. The decision not to grant her a pension was changed in her favour when the case was reconsidered under public pressure. She was granted a full pension of $936 per year. Between 1918 and 1920, Rose Powless moved to Michigan with Thomas John Collick and her four youngest children. David John Powless’s five children from his first marriage with Louisa Maracle all stayed in Canada. Rose had two more children with Thomas Collick and died in Otsego, Michigan in April 1967. David John Powless was buried in Prospect Cemetery, Toronto. Benjamin Lawrence Woundy died of pneumonia caused by Spanish flu on this day in 1918 at Camp Rathbun hospital in Deseronto. 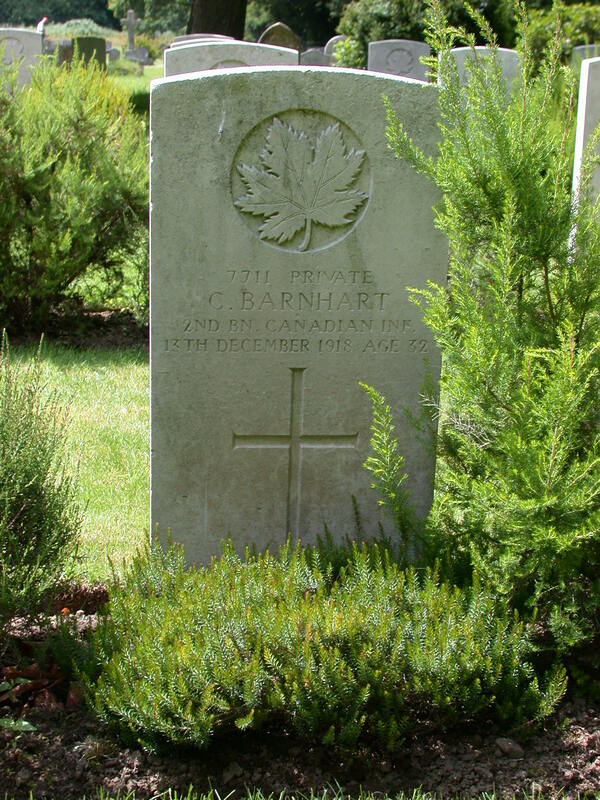 He had joined the Royal Air Force as a pilot cadet in Toronto on April 8th, 1918 with the service number 171339. He was five feet seven inches tall and was a bank clerk from Grand Bank, Newfoundland. The Royal Air Force casualty card for Woundy notes that he was admitted to hospital on November 21st. Immigration records pick up Woundy arriving in Halifax, Nova Scotia from Newfoundland in November 1916, giving his occupation as ‘student’. In July 1917 he left Halifax for Havana, Cuba, by which time he was a bank teller. He arrived in Ontario on April 5th, 1918 via New York state. Benjamin’s parents, James and Elizabeth Woundy, buried him in the Grand Bank United Church Cemetery. Thomas Peter Wims died in Glasgow, Scotland, on this day in 1918 of influenza in the 3rd Scottish General Hospital (Stobhill Hospital). He was buried in the Glasgow Western Necropolis. 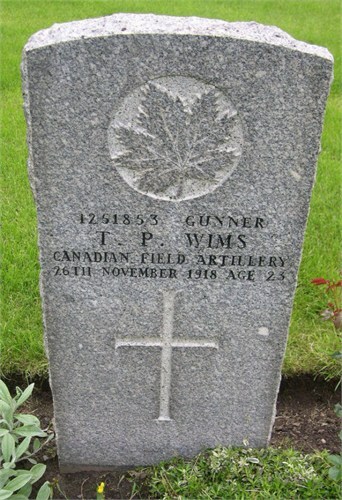 Photograph of Thomas Peter WIms’ grave, courtesy of Ancestry user mystrwolf. The collections of the Deseronto Archives are now housed inside the Community Archives of Belleville and Hastings County in Belleville. Open Monday to Thursday, 9.30 to 12 and 1 to 4 and on Fridays and Saturdays by appointment. You can contact the archivist, Amanda Hill, by email or by phone at 613-967-3304. You can post your photographs or memories of Deseronto directly onto our 'About Deseronto' site.